It was about halfway through the third song of the night, “Drew,” when the strings really came sweeping in, epic and autumnal and you could feel a wave of electricity sweep across the audience at Beacon Theatre last night (9/10). It was an honest-to-goodness hair-on-the-back-of-your-neck moment and what would be the first of many that night. Goldfrapp‘s gorgeous new album, Tales of Us, is drenched in the kind of strings that haven’t been in fashion since John Barry stopped scoring James Bond films, and the 20-strong Wordless Orchestra brought it to dramatic life. Of course the main star of the night (their only North American show this year) was Alison Goldfrapp, whose voice was in pristine form and whose blouse billowed in cinematic fashion. We got the Tales of Us played front-to-back (minus the LP’s sold electronic cut, “Thea”) followed by a short break and then a six-song encore older songs that fit the mood, augmented by a choir and the other half of Goldfrapp, Will Gregory. We got two Morricone-esque cuts from their 2000 debut, Felt Mountain (“Paper Bag” and “Lovley Head”) and a showstopper rendition of “Caravan Girl” that earned a genuine standing ovation. Great night, maybe show of the year for me so far. As I left the theater couldn’t help but wonder why Goldfrapp hasn’t actually done a Bond theme? She’d knock it out of the park. 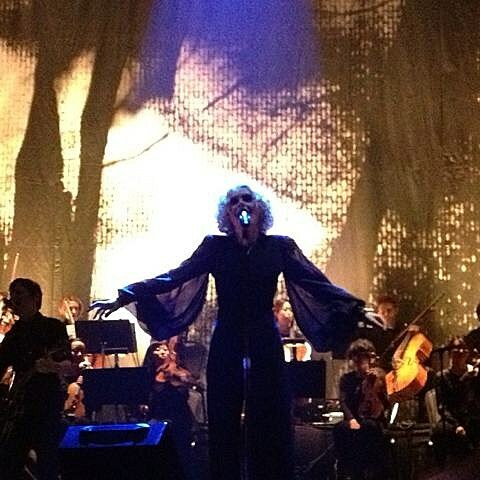 While in NYC Goldfrapp taped a performance for Late Night with Jimmy Fallon but it won’t air until September 26. Goldfrapp setlist and a couple videos from Beacon Theatre, below.